La discografia ufficiale segnala come primo disco di Pat Benatar l'album "In The Hit of the Night". In realtà la prima registrazione risale al lontano 1974 con il 45 giri "Day Gig". 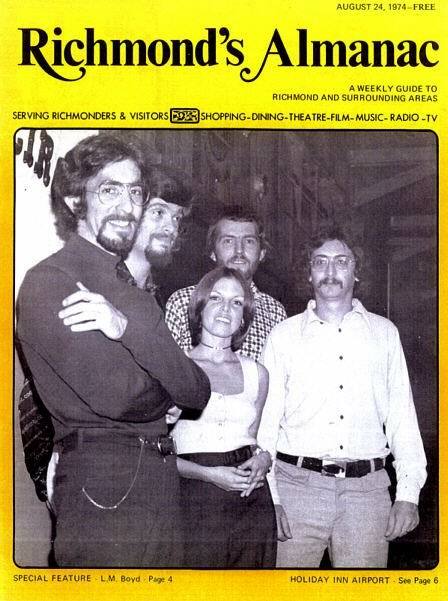 Pubblicato dalla Trace Records nel periodo in cui Pat viveva in Virginia, Day Gig trasuda letteralmente l'atmosfera dell'epoca. 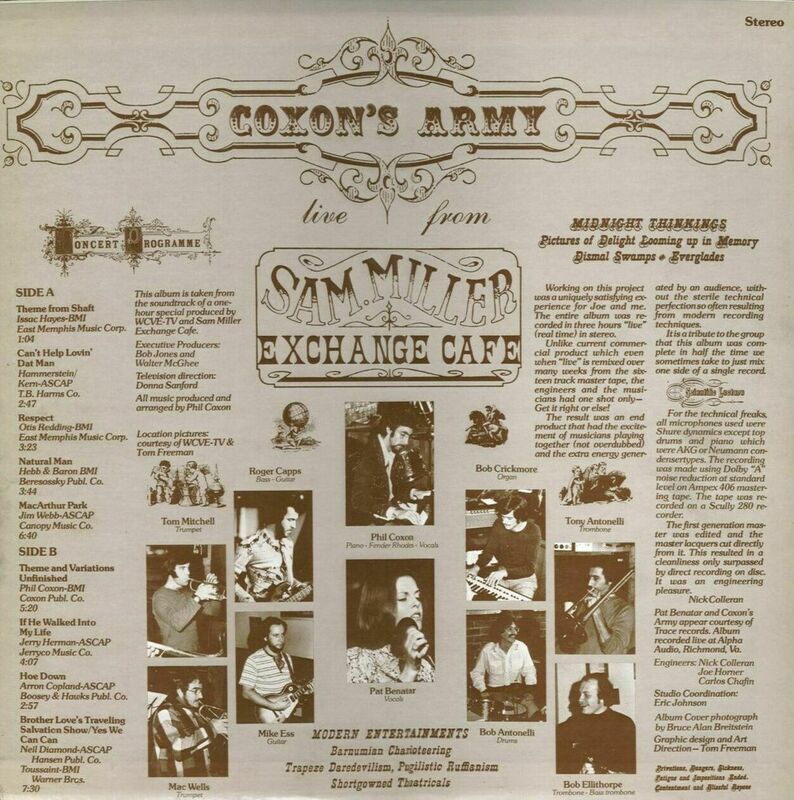 Lo stesso anno Pat si unirà ai Coxon's Army, una band che frequentava il circuito di Richmond (VA).La testimonanza su vinile di questa collaborazione è data dall'album "Live from Sam Miller's Exchange Cafè" (1974) in cui Pat canta le seguenti canzoni: Respect, If He Walked into my Life, Can't Help Lovin' Dat Man ed il medley Brother Love's Traveling Salvation Show / Yes We Can Can. Il destino ha voluto che all'interno di Coxon's Army Pat incontrasse Roger Capps (alla destra della foto) che suonò il basso nella band per i primi anni della sua straordinaria carriera. Tutte le canzoni che Pat cantò in quel periodo nulla avevano in comune con lo stile che la condusse al successo qualche anno più tardi. E' per questo che in "Synchronistic Wanderings (Recorded Anthology 1979-1999)" Pat a Neil, personalmente coinvolti nella compilazione del progetto, non inserirono volutamente queste tracce. Le doti vocali di Pat erano però già tangibili ed alcune sonorità di quei giorni verranno forse inconsciamente riprese in "True Love" (1991). Se volete tuffarvi nel passato per ascoltare Day Gig ed il suo lato B Last Saturday cliccate su www.benatar.it/GRUPPO%20ITA/1974.htm . (E' necessaria una connessione ad alta velocità). local PBS TV special. It features a performance by the band, Coxon's Army. What makes it interesting is that one of the vocalists is a 21 year old Pat Benatar. preppy establishment in Shockoe Slip, then a freshly renovated section of Richmond, Virginia. Pat sings lead vocals on some, back-up on others, and a few are instrumentals. recorded on a Scully 280 recorder. on almost that many....We lost a few bucks. We almost always did with local distribution. to all the countless other artists that I will never be able to remember. it. "Just sh*t-can that old junk...Nobody wants it". So that's how I ended up with 5 copies. 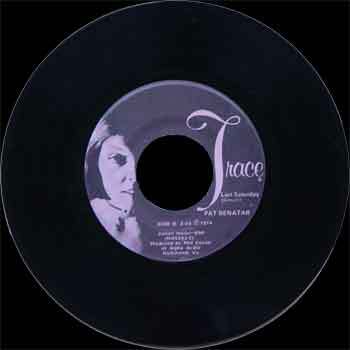 (which were all on Trace Records)....but was from the batch sold directly at their shows. Over the next few years, I gave away 4 of my copies to friends that were Benatar fans. for $500. Why the heck was I giving my extras away?!? his wife (girlfriend back then) was the singer in another band that I was associated with. and he would hang out at my place and jam in the basement where I kept my drum kit. 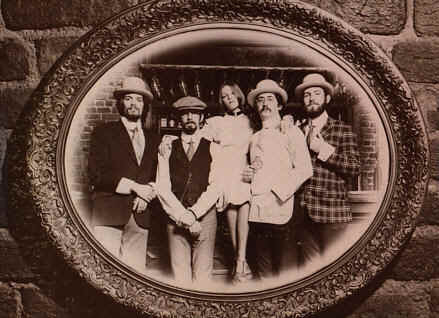 Harvey already knew each other, and he would often use Harvey's bass amp. critters down there. Beyond that I have no particular memory of what she sang, ect. from the actual facts, but it's the way I remember it from my limited perspective. ever came out to my new place in the country. he is the coordinator of Virginia Commonwealth University's jazz guitar performance program. requested that this material not be used...that "those songs were just so different."